I am writing directly to you to express the Foundation’s grave concern about the inevitable serious damage to human health, which will occur if the proposed Rye Park Wind Development is approved. Unlike the NSW Health Department, the Waubra Foundation has investigated these problems directly at NSW wind developments. The problems reported by NSW residents for over ten years are consistent with those being reported around the world. I have been working specifically in this area of low frequency noise and health full time for four years, and have given expert evidence in court proceedings in Canada and In Australia. It is our opinion that previous advice given by the responsible officials from NSW Health to NSW Planning and NSW PAC members about wind turbine noise related adverse health effects (“no evidence of a problem”) is at best grossly ignorant, at worst willfully blind. We therefore urge you, as the NSW Government Minister ultimately responsible, to take heed of the warnings about serious harm to human health from wind turbine noise being increasingly expressed by researchers, medical practitioners, acousticians and scientists internationally, who have direct knowledge of the severity of the health problems, unlike the NSW Health Department who have refused to investigate for themselves. I have attached a recent summary of the state of knowledge in this area, dated 1st June, 2014 together with a number of other documents which are of relevance, including a detailed critique of the latest 2014 NHMRC literature review, which details the material which was omitted from that literature review. I have also attached some of the material sent to the Australian Medical Association from international researchers and clinicians who were extremely concerned at the ignorance and bias contained in the AMA’s recent position statement, and very concerned at the harm that would ensue if that advice was relied upon. Predictably wind developers including Epuron are publicizing that misleading AMA statement in order to mislead the public about the adverse health impacts which are very well known to the global wind industry (see http://www.epuron.com.au/wind-farms-health-australian-medical-association/ ). The abovementioned material together with the large body of related research, and our direct knowledge of the problems being reported by residents living near wind developments in Australia and internationally provides the background context to the weight of our concerns about the impact of the Rye Park proposal on the immediate neighbours, out to at least 10km from where the wind turbines are located. We have been advised there is a school in Rye Park, currently with 23 students and approximately 240 residents in Rye Park itself, but many more residents in the surrounding area out to 10km from the proposed wind development, which include part of the towns of Boorowa, Yass, Dalton as well as Rye Park. We note that 10km is increasingly being acknowledged as the “acoustic impact zone” for large wind turbines, most recently by acoustic consultants working for a Thai wind developer, RATCH (see further details below). We first mentioned the 10km distance in our Explicit Cautionary Notice, which we sent to the NSW Departments of Planning and Health in June 2011. That Explicit Cautionary Notice and the reference to 10km was compiled because of the reports of characteristic symptoms and health problems from residents living out to that distance at wind developments in Australia, particularly the then only 3MW wind development (Waterloo in South Australia). Our concerns have only increased since then, with the evidence collected independently of the Waubra Foundation contained in the population noise impact surveys conducted at Cullerin in NSW, Macarthur in Western Victoria and Waterloo in South Australia, and the independent acoustic evidence collected independently of the Waubra Foundation which is confirming the presence and effects of wind turbine infrasound and low frequency noise out to that distance (see appendix 1 for details). We note that Rye Park town itself is in a valley, and that the turbines will be on the ridges, which is known to increase the distance of sound propagation, especially with temperature inversions, common in this area. Wind turbine sound is well known to travel along valleys. We note there are two other large wind developments proposed for the area (Bango Wind Development (122 turbines to the west of Rye Park) and Rugby Wind Development (52 turbines to the north of Rye Park) which increase our concerns about the cumulative adverse acoustic impact of all these projects, particularly on residents in the town of Rye Park. The significant adverse health consequences resulting from chronic exposure to excessive environmental noise resulting in chronic sleep disturbance and chronic stress and their serious downstream health consequences are detailed in numerous World Health Organisation major literature reviews on noise since 1995 (Community Noise 1995 and 1999, Night Noise Guidelines for Europe 2009, and Environmental Noise – Burden of Disease 2011 see http://waubrafoundation.org.au/information/acousticians-noise-regulators/literature-reviews/ ). They are also documented in a major Australian literature review on Environmental noise in 2004 (http://waubrafoundation.org.au/resources/health-effects-environmental-noise-other-than-hearing-loss/ ). In other words, this issue of serious health problems being caused by excessive environmental noise is not new. The longer the period of time the residents are exposed to excessive noise, the worse the cumulative effect will be on their health, and the greater proportion of the population who will be adversely impacted and report disturbance from the noise, because of progressive “sensitization” to the wind turbine noise (known and described in 1985 by Dr Neil Kelley et al http://waubrafoundation.org.au/2013/explicit-warning-notice/ and also documented by Professor Geoffrey Leventhall in 2003 http://waubrafoundation.org.au/resources/review-published-research-low-frequency-noise-leventhall/ ) and noted by UK ENT specialist Amir Farboud in 2013 (http://waubrafoundation.org.au/resources/wind-turbine-syndrome-fact-or-fiction-farboud-et-al/ ). Progressive worsening of the noise related sleep impacts with cumulative exposure on a given population is illustrated by the population noise impact surveys conducted in 2012 and 2013 by NSW resident Mrs Patina Schneider, on the Cullerin Range wind development, just outside of Goulburn (see appendix 1). Your department officials and other public servants and ministers in the NSW government are well aware of the reported wind turbine noise related sleep and health problems at Cullerin, and other NSW wind developments, but have done nothing to improve the regulation of excessive noise from wind turbines which is harming the health of NSW citizens in predictable ways. b) the prohibition of torture and cruel, inhuman and degrading treatment. The longstanding attitude of neglect towards, or bias against rural residents badly impacted by environmental noise from wind turbines and other sources such as coal mining is blatantly discriminatory. Documented public statements by some NSW public service employees that rural residents are “collateral damage” (in the case of wind turbine noise) could be held to indicate “intent”, and a discriminatory attitude, when complaints of human rights abuses currently being prepared by some residents severely impacted by environmental noise are lodged with the Human Rights Commission. Other UN conventions and covenants stipulate that the state will help individuals to attain the best possible physical and mental health (see https://www.humanrights.gov.au/chart-related-rights-and-articles-human-rights-instruments-human-rights-your-fingertips-human-rights ). This is impossible for rural residents to achieve if environmental noise pollution including wind turbine noise pollution is not properly regulated, independently of the noise polluter. From a planning perspective, if wind turbines are sited too close to homes this will also result in predictable and serious harm to health. There is documented harm to sleep and health in residents living out to 10km from existing wind developments in NSW, Victoria and South Australia (appendix 1). Wind turbine noise is being measured inside these homes, and increasingly acoustic events involving infrasound and low frequency noise are being shown to correlate directly with particular sensations perceived by the residents, which is consistent with the NASA & Kelley US research in the 1980’s (see particularly Professor Con Doolan’s work at Waterloo in South Australia http://waubrafoundation.org.au/resources/characterisation-noise-homes-affected-by-wind-turbine-noise/ as well as Mr Les Huson’s acoustic data collection at Macarthur in Western Victoria relating to “pressure bolt sensations” http://waubrafoundation.org.au/resources/huson-l-expert-evidence-at-vcat-cherry-tree-hearing/ and most recently Mr Steven Cooper’s acoustic survey work at Cape Bridgewater, commissioned by Pacific Hydro, currently being completed (preliminary details here: http://waubrafoundation.org.au/resources/trist-sonia-pacific-hydro-meeting-with-cape-bridgewater-residents-june-2-2014/ ). The knowledge of direct causation of “annoyance” symptoms including sleep disturbance from impulsive wind turbine generated infrasound and low frequency noise is not new, but has been long ignored and denied by the wind industry, who are well aware of it. It is unfortunate that much of this crucially important research by credible research institutions was not included in the recent NHMRC literature review or draft information statement. Researchers including NASA and Solar Energy Research Institute scientists led by Dr Neil Kelley in the USA established direct causation of “annoyance” symptoms from wind turbine noise in the 1980’s, which we have summarized in our Explicit Warning notice, also attached. These research findings were consistent with previous scientific knowledge relating to military aircraft noise by Harvey Hubbard. Kelley also established a dose response relationship and recommended maximum exposure levels to help protect people from the adverse effects, which were based on his empirical data. These exposure levels for chronic exposure to infrasound and low frequency noise were also ignored by the wind industry and its acoustic consultants, and no government wind turbine noise guidelines anywhere in the world has incorporated their measurement. This is hardly surprising given the very active role wind turbine manufacturers and developers have played in helping to write wind turbine noise guidelines – a gross financial conflict of interest which should never have happened. The South Australian wind turbine noise pollution guidelines adopted by NSW were based on guidelines written in the UK called ETSU 97, which had a significant number of wind developer’s acousticians involved, and whose priority was the expansion of the British wind industry. Whilst acousticians have a professional obligation to protect the health and safety of the public above commercial considerations, it is clear that has not happened. o So called “good neighbour agreements” which stop neighbours from complaining in the future about noise & health impacts. These have been particularly aggressively used by New Zealand developers Trustpower (http://waubrafoundation.org.au/resources/neighbour-deed-palmer-wind-farm-south-australia/ ) and Meridian Energy, including in Western Australia. • Confirmation by Professor Geoffrey Leventhall that he has known of the symptoms of “wind turbine syndrome” for years at the NHMRC workshop in June 2011, and in court proceedings in Canada. Professor Leventhall was one of two undisclosed peer reviewers of the first NHMRC literature review, who has worked with the wind industry for some years to protect its interests in various court proceedings internationally. The inevitable results of this denial of the established science about the known adverse health impacts resulting from exposure to infrasound and low frequency noise, are the shattered lives and communities in places like Waterloo, South Australia and Macarthur in Western Victoria where VESTAS V 90 and V 112 wind turbines have destroyed the sleep, health and amenity of a growing number of local residents. The experiences of these residents have been documented in senate inquiries, and in affidavits to legal proceedings in both Victoria and South Australia, and in no instance was the truth of the resident’s accounts questioned or disputed. It is also of importance that these two wind developments using 3 MW turbines (Macarthur and Waterloo) as well as Cullerin Range in New South Wales (2 MW turbines), do not have the recommended turbine separation distances between them – they are far too close together, which inevitably increases the wake turbulence and the amount of infrasound and low frequency noise generated. The NSW SEDA Wind Farm Planning Handbook from 2002 acknowledges the importance of adequate turbine separation distances (5 – 8 rotor diameters apart http://waubrafoundation.org.au/resources/nsw-wind-energy-handbook-2002/ ) and yet the wind industry are pushing to have wind turbines sited much more closely together (eg 3 – 5 rotor diameter separation distances) at numerous wind developments across Australia (Cherry Tree in Victoria and Stony Gap in South Australia). This is occuring despite longstanding research from NASA showing that increased generation of wind turbine infrasound and low frequency noise will result from upwind bladed wind turbines if the inflow air is turbulent (http://waubrafoundation.org.au/resources/shepherd-k-hubbard-h-noise-radiation-characteristics-westinghouse-wwg-0600-wind-turbine-generator /). A useful visual dynamic depiction of this turbulence, from the tip vortices, was recently captured by researchers at the University of Minnesota using laser lighting during a snow storm http://waubrafoundation.org.au/resources/university-minnesota-eolos-research-new-study-uses-blizzard-measure-wind-turbine-airflow/ . At static depiction of the wake turbulence and the extent of the impacts (out to 20km) from Maritime wind development at Horns Rev in the Atlantic is illustrated below. This increased generation of infrasound and low frequency noise is further exacerbated when larger wind turbines are used, because the sound energy generated from larger more powerful machines shifts down to the lower frequencies (http://waubrafoundation.org.au/resources/moller-pedersen-low-frequency-noise-from-large-wind-turbines/ ). Recent industry independent research from Johns Hopkins University has found that maximum energy generation efficiencies are obtained with turbine separation distances of 15 rotor diameters (http://www.windturbinesyndrome.com/2011/wind-farm-operators-are-going-to-have-to-space-turbines-farther-apart-johns-hopkins-univ-researcher/ . 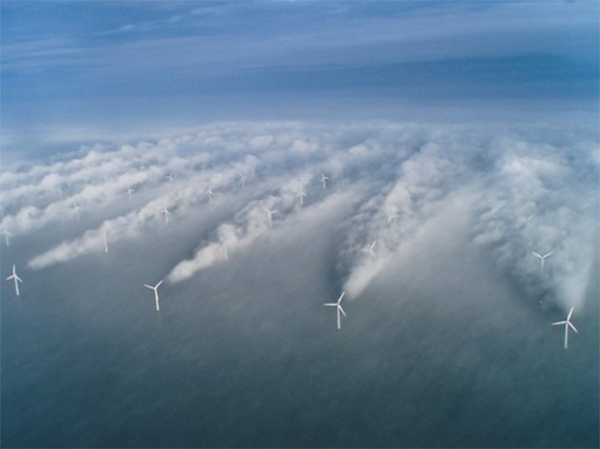 Recent Adelaide University research published this year has confirmed that the tip vortices start breaking down at 7 rotor diameters distant from the turbine emitting them (https://www.wind-watch.org/documents/a-discussion-of-wind-turbine-interaction-and-stall-contributions-to-wind-farm-noise/ ). It would therefore appear that a minimum of 7 rotor diameters should be used by wind developers as spacing between large wind turbines, in order to prevent the generation of excessive noise, including infrasound and low frequency noise, at least until further research is conducted to evaluate the human and acoustic impacts of using that separation distance. At the very least, in NSW, the 5 – 8 rotor diameter separation distances should be being adhered to, in accordance with the 2002 SEDA Handbook. I have attached the Waubra Foundation’s submission to the Federal Renewable Energy Target review, which contains correspondence and data from independent acousticians Dr Malcolm Swinbanks and Mr Les Huson from the UK and Australia respectively which illustrates this point with respect to the Macarthur wind development in Victoria (see appendix http://waubrafoundation.org.au/resources/renewable-energy-target-review-waubra-foundation-submission-2014/ . The serious adverse health effects including repetitive sleep deprivation and other symptoms euphemistically called “annoyance” have been known to the global wind industry and its acousticians for over thirty years (see http://waubrafoundation.org.au/resources/james-r-warning-signs-that-were-not-heard/ ). UK Acoustician Professor Geoffrey Leventhall has publicly stated at the NHMRC workshop in Canberra in 2011 that the symptoms known to him as “annoyance” are identical to those described by Dr Nina Pierpont as “Wind Turbine Syndrome” (WTS). WTS is being acknowledged by increasing numbers of doctors and researchers globally, including most recently Dr Colette Bonner, the Irish Deputy Chief Medical Officer, and Dr Steven Rauch, a leading US otoneurologist from Harvard Medical School. In addition to the sleep deprivation, annoyance symptoms and impaired quality of life which the recent 2014 NHMRC commissioned Systematic Literature Review identified, there is a disease complex known as “Vibroacoustic Disease”, (VAD) caused by chronic exposure to infrasound and low frequency noise and vibration, also described in the scientific literature for thirty years, which has more recently been identified in neighbours to wind turbines. The pathology associated with VAD is permanent, serious, and a growing public health problem because of the lack of noise pollution regulation of sound energy frequencies down in the infrasound and low frequency noise part of the sound spectra. VAD has been demonstrated in wind turbine neighbours in Portugal (http://waubrafoundation.org.au/resources/alves-pereria-m-castelo-branco-n-ltr-australian-new-zealand-journal-public-health/ ) and reported by rural residents living near wind turbines in Germany (http://waubrafoundation.org.au/resources/windwahn-story/ ). Symptoms and disease complexes indicative of both WTS and VAD are being reported in an increasing number of rural Australian residents, together with exhaustion from sleep deprivation. Sleep deprivation has been determined by courts to be an act of torture, or cruel and inhuman treatment because “sleep is considered a basic life necessity” (“Leave No Marks” http://physiciansforhumanrights.org/library/reports/leave-no-marks-report-2007.html ). Sleep deprivation is well known to clinical medicine to be extremely damaging for mental and physical health, if it is prolonged. This is increasingly being demonstrated in the research literature, documented at length in the WHO guidelines for night time noise (http://waubrafoundation.org.au/resources/who-night-noise-guidelines-for-europe/ ) and also since (http://waubrafoundation.org.au/resources/sleep-duration-predicts-cardiovascular-outcomes/ , http://waubrafoundation.org.au/resources/munzel-t-et-al-cardiovascular-effects-environmental-noise-exposure/ ). Regardless of any other symptoms and health problems particular susceptible individuals may develop with exposure to excessive infrasound and low frequency noise, the cumulative sleep deprivation and its well known consequences will be the inevitable consequence for many residents in the vicinity of the Rye Park wind development, if it is approved by the NSW Government. If this wind development is approved, those responsible for approving it cannot say they were not warned of the predictable serious adverse health consequences. Mrs Schneider’s 2012 and 2013 population noise impact surveys show the extent of the sleep deprivation. Nothing has been done about the severe night time noise related sleep disturbance and adverse health impact for these NSW residents by any NSW government department, despite many complaints which are documented in the 2013 survey. This survey was conducted only 6 months since the wind development commenced operating. Residents report being far more adversely impacted now, because of the predictable and known adverse cumulative health effects of chronic sleep deprivation and chronic stress.